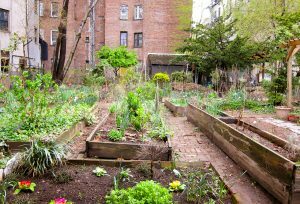 Community garden in New York City. Many New Yorkers own land in the South. Photo by Eric Wittman, CC 2.0. 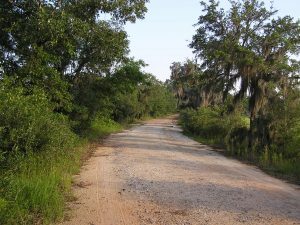 Urban-rural connections are quite important for land and forest management in the South. From the early 1900s to about 1970, many African Americans migrated from southern farms to industrializing northern cities, and since then many have returned to their homelands. As a USDA Forest Service researcher, I’ve studied African American forest landownership since 1999. I am currently working with the Sustainable Forestry and African American Land Retention Project (SFLR). The SFLR is a partnership between the USDA Natural Resource Conservation Service, the U.S. Endowment, and the Forest Service. Since 2012, SFLR has supported community-based assistance programs in seven southern states. In talking to landowners about our recent work with the SFLR, connections between Brooklyn, NY and the rural southern area around Charleston, SC really stood out. And as our SRS publications and other resources went out into the world, I began getting calls from people in northern cities asking who could help them with their southern land. I got an email from a young woman in New York. Her grandfather had land in South Carolina. He had migrated to Brooklyn, but now lived in Denver, and she was interested in learning more about the land in South Carolina. She was a garden intern at the Battery Park community garden in Manhattan. We talked about New York-southern connections and I became determined to explore these further. I reached out to Erika Svendsen, Lindsay Campbell, and Laura Landau with the NRS Urban Field Station in New York. Had they encountered people with southern connections? Schelhas and his colleagues at a community garden conference in New York. From left to right: Erica Svendsen (NRS Urban Field Station), Justine Marcel (FS intern and student at Université Paris Diderot), John Schelhas, and Jennifer Smith (FS International Programs). USFS photo. They said New Yorkers often talked about the South, particularly those who were involved in community gardens. Perhaps there were more people in New York with land in the South. Migration, including return and circular migration, interests social scientists. We wondered how we could learn more, and maybe develop a larger community-based research effort. 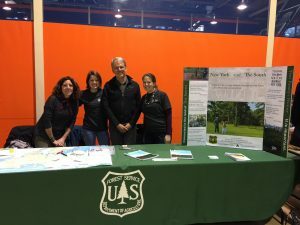 In January, I participated in the New York Urban Field Station’s monthly Stewardship Salon. Members from community groups come together to talk about environmental stewardship topics with enthusiasm. At this Salon, we read landowners quotes from our research and talked about our own connections to other places. In March, I went to 34th GreenThumb GrowTogether Conference in New York, which focuses on community gardens. I developed a poster for a shared Forest Service table with the NY Urban Field Station. My goals were to talk with people with connections to the rural South and meet folks from organizations in NY that might be interested. The experience exceeded my expectations. Our poster and shared table was a great place to meet people with connections to the South. I talked to 40 or 50 people with connections to the South – most still had land there. Numerous people had connection to South Carolina – particularly the Charleston, Orangeburg, and Columbia areas. There were also many people with connections to North Carolina, mostly in the Wilmington area. I connected several people with resources, including a man from Walterboro, SC who had both heirs’ property and his own property. He was interested in planting trees. I put him in touch with Vince Keeler at the Center for Heirs’ Property Preservation. I also talked with a woman whose mother was moving back to NC. She had 100 acres of land and was worried about the expense of clearing all the trees that had grown up. I talked with her about forest management and the value of trees. Many New Yorkers have connections to the rural south – particularly rural areas around Charleston, SC and Wilmington, NC. Photo by Henry de Saussure Copeland, CC 2.0. In my research with African American forest owners, we have frequently encountered landowners who returned to family land either to care for aging parents or after retirement. Many are engaged landowners, working to resolve heirs’ property and engage in forestry. Some interesting research questions remain. What is the nature of these relationships between two places? How do they influence people’s identity and families? What do these relationships mean and how do they affect behavior, both in New York and in the South? What are the benefits of exploring these relationships? Understanding multi-local senses of place and bringing out these stories could be beneficial. There are opportunities to connect more people to the Sustainable Forestry and African American Land Retention program for help with heirs’ property and forestry. More SRS research on heirs property.